Everyone loves a delicious dessert, especially when it fits with our smart-eating goals. That's why we partnered with Dannon Light & Fit for this post. There's nothing like something sweet to end the day — or as a midafternoon snack. 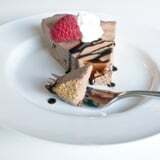 A slice of pie is traditionally considered a diet buster, but this recipe for one that clocks in at 140 calories per serving is beyond tasty. 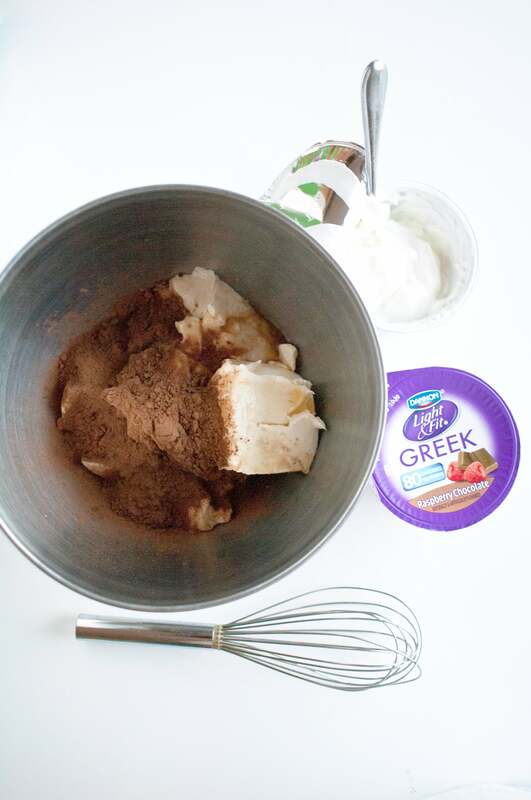 The combination of silky tofu, Dannon Light & Fit Greek Yogurt, and cocoa powder whip wonderfully together into a creamy pie. 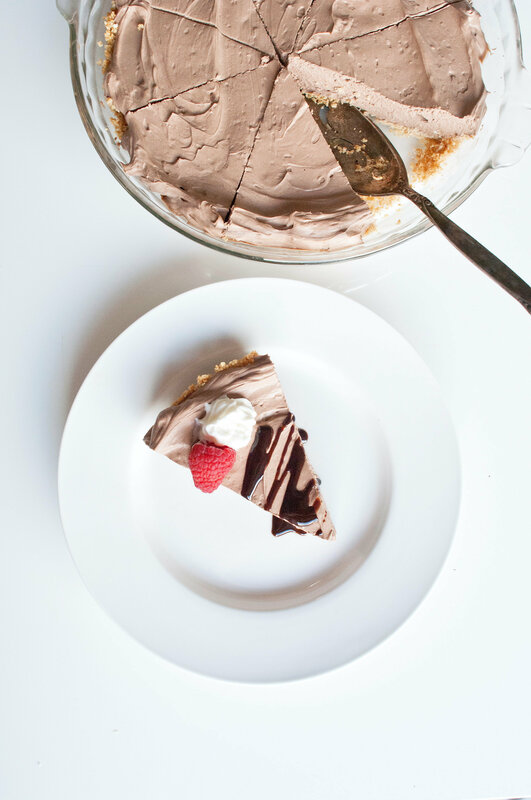 Creating a crust with low-fat graham crackers and coconut oil adds just the right texture as a crumbly base. 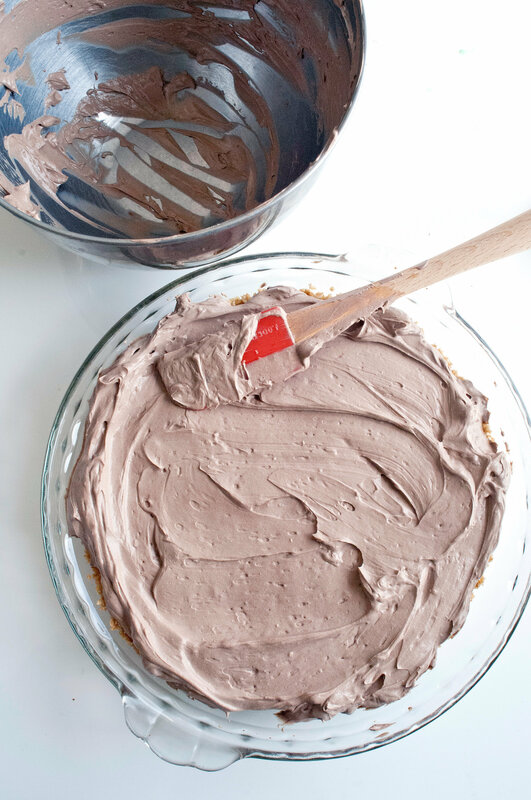 After pressing around the pie pan, use a spatula to add the filling, then smooth. Be patient and wait for it to set up overnight in the fridge. Serve a slice on its own and enjoy. Or finish with fresh raspberries and low-fat whipped cream. 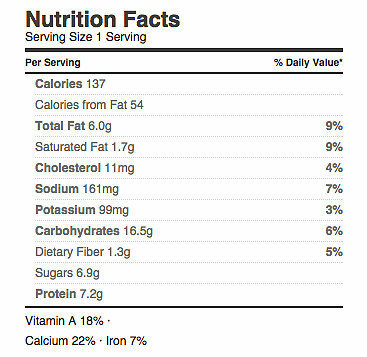 Just remember that those additional toppings add extra calories to the nutritional breakdown listed below. So good. Draining the tofu adds to the texture of the pie, but you can skip the step if you're short on time. Line a strainer with paper towels and then add the silken tofu. Place another piece of paper towel over the top and then a small plate. Pop in the fridge and let strain for 30 minutes. Place the graham crackers and coconut oil in a blender and pulse until it resembles grainy sand. Press into the base of a 9-inch pie pan in one even layer. Add the cream cheese, tofu, yogurts, honey, vanilla, and cocoa powder into a bowl and whip until smooth. In a small saucepan, measure and add the water, along with the packet of unflavored gelatin. Let sit for one minute then bring to a boil, whisking to ensure the gelatin has melted. Slowly pour the gelatin into the chocolate base while whipping on low. Pour into the pie pan and smooth using a spatula. Let set in the refrigerator for 4 hours, preferably overnight.